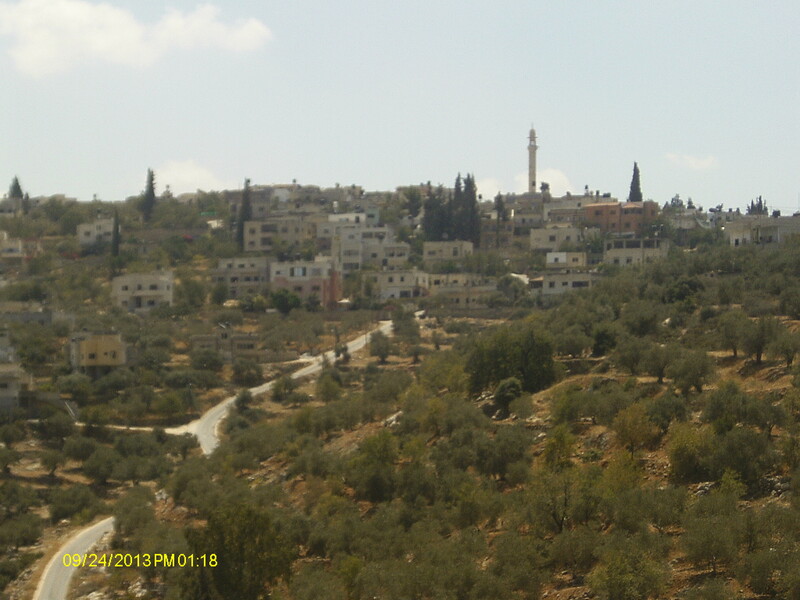 Today, Monday 26th August, Israeli occupation forces invaded the village of Bruqin in the early hours of the morning. The Israeli army then proceeded to enter twelve houses and arrest 11 young men from the village. The men were aged between 18 and 27 and they were held for 7 hours before being released at 10:00 this morning. Mohanned, a 27-year-old music teacher was one of the young men arrested, alongside his brother, 25-year-old Hammed. The brothers and their whole family were awoken by the Israeli army entering their house at 02:30. The soldiers demanded to see the ID of all the men present and gave no reason for their commands or presence in the village. The situation was very similar for 24-year-old Feher, a builder who was arrested at 03:00. Mohanned, Hammed and Feher were removed from their homes, blindfolded and handcuffed, along with the other young men taken. The Israeli army was described as “aggressive but not violent” with no injuries sustained. One resident of Bruqin described the invasion as “quiet” although there were at least 50 soldiers in 5 military jeeps and this was “very frightening for the villagers”. He then continued to state that he believed this was supposed to act as an intimidating warning to the people of Bruqin. 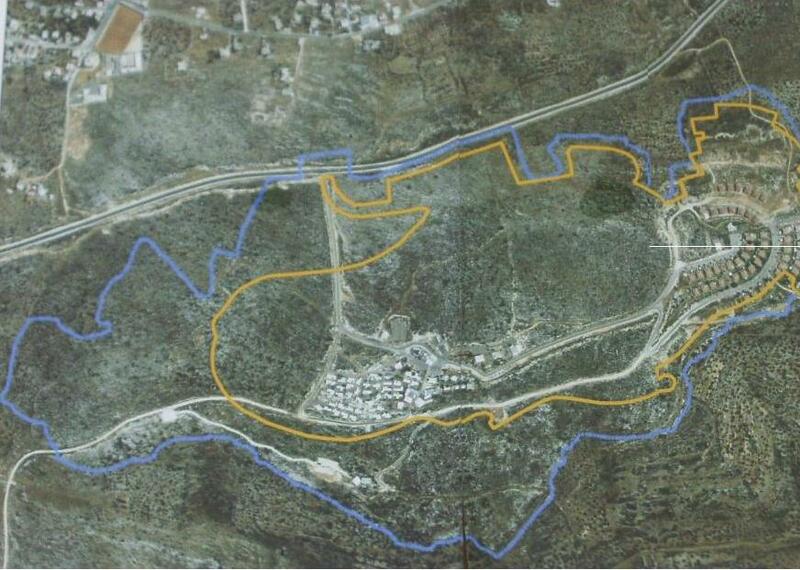 It does not seem unrelated that the village is currently at risk of losing 700 dunums of land to the nearby (illegal) settlement of Bruchin. The below picture highlights the areas that are at risk and the residents have been attempting to fight this illegal theft of vital farming land over the last two months. However in order to adhere to the court process, the residents must access their land to attain the correct measurements to supply to the court. 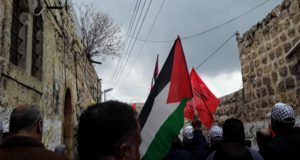 However due to violent settler attacks many people are unable to enter their own land and as such the mayor of Bruqin has had to apply for permission on behalf of the Bruqin residents. He is awaiting confirmation and as yet Bruqin has no information on the state of their court battle for land they legally own. All settlements in Palestine are illegal under international law and Bruchin is no exception. 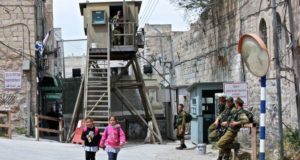 In 2012, the settler colony of Bruchin was “legalised” by the Israeli government, previously, even Israeli law classed Bruchin as an illegal outpost. Now that Bruchin has the “official” support of its own government, it is attempting to steal land from a number of villages to build 550 new settler homes. 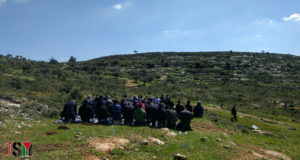 The residents of Bruqin, the legal owners of many of the dunums in question, are determined to fight this land grab, but many are apprehensive about repercussions from the Israeli army if they continue to resist. It seems apparent that from this morning’s action, their concerns are unfortunately justified.